A word about cryptolinks: we are not responsible for the content of cryptolinks, which are merely links to outside articles that we think are interesting, usually posted up without any comment whatsoever from me. Today I found out the origin of the Bigfoot legend. Stories of a giant, hairy creature that appears half man and half ape have existed in various parts of the world for many centuries. In fact, the only continent not to have stories of “wild men” is Antarctica. In the Himalayas, it’s the Yeti. 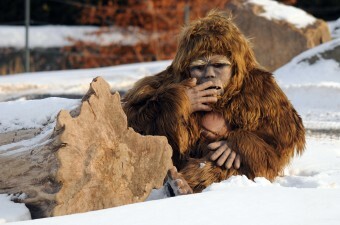 In Canada, it’s the Sasquatch. And in the northwest United States, it’s Bigfoot. Bigfoot is described by believers as being between six and eight feet tall with a large forehead and pronounced brow, like a cave man’s, and a rounded, crested head like a gorilla’s. He is covered in brown or red hair and has enormous feet that are his namesake, with the biggest estimation at a whopping two feet long by eight inches wide. Some “witnesses” claim that the five-toed Bigfoot prints they saw on the ground were accompanied by claw marks (not unlike a five-toed, clawed paw print of a bear—but rational explanations aren’t as fun). Stories of a “wild man” existed among the Native Americans of the Pacific Northwest long before white colonists moved in. Versions of Bigfoot ranged from harmless giants who stole fish from fishermen’s nets, to cannibalistic monsters living on mountain peaks. These stories varied from tribe to tribe, and even from family to family, which meant that Bigfoot had a lot of different names. In the 1920s, J.W. Burns compiled the local legends for a series for a Canadian newspaper, coining the term “Sasquatch” in the process. Christ, how lond did she spend researching that, five minuets? That has to be one of the most p*** poor bit of writing i've ever seen. A ten year old could do better.